CT scan abdomen cost in Mumbai - Know how to pay less! A computed tomography scan popularly known as CT is a type of specialized X-ray. The CT abdomen and pelvis scan captures cross-sectional images of the abdomen and pelvis area and sends the images to a computer, where they’re viewed by an experienced radiologist for analysis. An abdominal CT scan helps the doctor to see the organs, blood vessels, and bones in the abdominal cavity. This scan helps in diagnosing ailments associated with stomach, intestines, small bowel, colon and other internal organs. Why is an Abdominal CT scan prescribed? The patient cannot eat anything 2 – 4 hours before the scan, and need to be empty stomach. The patient is provided with the hospital gown. Depending on the requirement, the patient is given an oral contrast dye, which will help in giving better images for results. The patient needs to wait for 60 – 90 minutes until the cells and tissues absorb the contrast agent. The circular X-ray emission scanner moves around the abdomen area and captures images of the organs inside the abdomen. This CT captures a cross-sectional “slice” of the abdomen. CT scan of abdomen helps in accurate diagnosis of abdominal diseases and a typical abdomen CT scan may take 10 – 30 minutes. The doctor must be informed prior if the patients is pregnant or breast feeding, if he/she has any allergies or if he is diabetic. According to the World Bank’s study, the present healthcare infrastructure of Mumbai was planned between 1950 and 1980 to cater to 5 to7 million people, but the same is being used by more than 18 million people today. Although there have been new developments in the private healthcare sector, it is still not enough. Chronic diseases are increasing at an alarming rate in Mumbai. The growing number of kidney diseases, diabetes and other preventable and curable chronic diseases require diagnosis at the right time and a right place. Who decides the right place? It’s the accreditations and certifications from AERB, ISO and NABL. According to these authorities, only the centers that are recognized by them are fit to perform quality CT scans and produce accurate results. The centers need to follow certain rules and regulations from the technical configurations of the scanners to the thickness of the walls of the room used to perform these scans. The qualified Doctors, a full time radiologist and skilled technicians are also a part of the list. 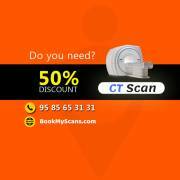 Mumbai has numerous hospitals and scan centers performing CT scans, but finding a quality scan center is a task. Actual cost of CT scan of Abdomen CT scan in Mumbai – How to pay less! 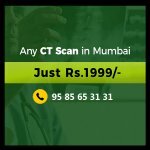 The actual cost of CT scan in Mumbai is between INR 1750 and INR 15,000. The cost of CT scan of whole abdomen and pelvis is around INR 4000. The cost differs depending on the CT scan of upper Abdomen and Lower Abdomen and pelvis. A contrast-enhanced CT (CECT) will cost you INR 2,000 more than the non-contrast CT (NCCT) scan of the abdomen. You can definitely pay lesser than the market price to avail this test. Here is the answer, BookmyScans.com. BookMyScans helps you in choosing the best diagnostic labs near you. We identify diagnostic centers, check on their quality standard and offer the best and assured discount on the market cost. BookMyScans partners only with centers that are approved and certified by AERB, ISO and NABL. We periodically audit our partners to make sure we meet the expectations of the patients in terms of quality services with best and standard equipments configured with Multi slice 16 to 64 Slice 3D scanners and who are technically competent to deliver accurate results. We have 25+ partners in Mumbai, & Navi Mumbai and plan to extend our services to make sure to provide affordable healthcare services to all. More than 25,000 people have been able to save 7.2 crores by choosing BookMyScans. Our platform is user friendly, convenient and easy way of getting your appointments online.